Lewis Hilliard (left) scored for Peterborough Sports at Berkhamsted. Photo: James Richardson. Peterborough Sports will attempt to bring some of their goal-crazy summer form into their first home game Division One central of the Evo Stik Southern League tonight (August 21). Sports, who hammered some decent sides in pre-season friendlies, started their league campaign with a hard-fought 1-0 win at Berkhamsted on Saturday courtesy of a first-half Lewis Hilliard goal. They host another newly-promoted side Welwyn at the Bee Arena, Lincoln Road tonight (7.45pm). Bedford Town striker Paul Benson. Welwyn also won their first league match of the season on Saturday, 2-1 at home to Didcot. Yaxley delivered an impressive 4-1 win over Barton Rovers in the first step four game in the club’s history on Saturday, but they couldn’t have a tougher away game tonight than at Bedford Town. Bedford won their opening fixture 5-0 away from home at Kidlington when former Football League star Paul Benson was among the scorers. Benson is 38 now, but played for Charlton, Luton and Portsmouth among others in a decent professional career. 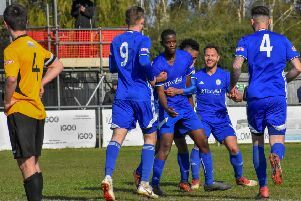 Stamford AFC and Spalding United are at home in the East Division of the Evo Stik Northern League against Loughborough Dynamo and AFC Mansfield respectively. Stamford started their season with an impressive 4-2 away win at Stocksbridge Park Steels on Saturday, while Spalding picked up a creditable point at Cleethorpes. Wisbech lost their first game at this level 1-0 at home to Frickley at the weekend. They travel to Carlton tomorrow (August 22). Bourne Town’s scheduled UCL Cup match at Harrowby tonight has been postponed. The teams will try again at the Abbey Lawns next Tuesday (August 28). East Division: Spalding Utd v AFC Mansfield, Stamford v Loughborough Dynamo. Division One Central: Bedford Town v Yaxley, Peterborough Sports v Welwyn Garden City.